This post is the second in a series of three posts and will help you with the creation of identity pass-through authentication from a client application to API and then to an Azure SQL Database. In this post we will create an Azure API Application with .Net Core to query the Azure SQL Database. Create a new project with the template: “ASP.Net Core Web Application (.Net Framework)”. Note: We create a ASP.Net Core Web Application with .Net Framework because the needed libraries for this solution are not build yet. This means this application will only run on Windows-based machines. 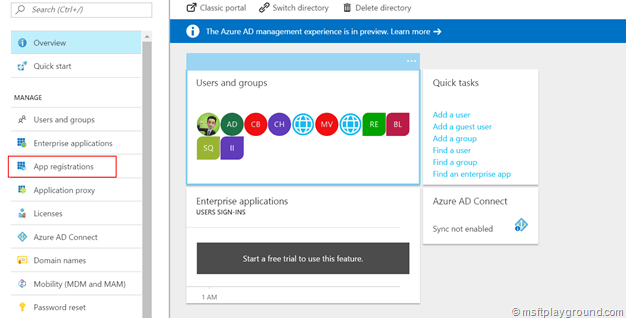 Select the “Web API” option and make sure you enable authentication in “Work or School Accounts” mode and choose your Azure Active Directory domain. Check in the project properties if you are using the target framework “.Net Framework 4.6.2” if not set it to this version. Setting up Application settings and adding HttpContext. With the empty project setup we can start by adding basic things we will need in our application. The first thing is application settings in order to authenticate against Azure Active Directory and the Azure SQL Resource. Add a new class and call it for example “ApplicationSettings” in this class we will add the properties we need in our configuration file. ClientId The client id of the current application registered in Active Directory. ClientSecret The secret of the current client application. To load these settings within the application we will also need to place them in the .Net Core application file “appsettings.json” in this file add the following section. Loading these settings need to our settings object need to be configured first. Therefor we need to adjust the “ConfigureService” method in the StartUp.cs file. In this method we also add the loading of the “HttpContextAccessor”, this is all done by using Dependency Injection. Because we do not want duplicate settings in our settings file we will adjust the “Configure” methods as well. Move the values from the “Authentication” – “AzureAd” section in the “appsettings.json”file to the newly added “AuthenticationSettings” section and delete the complete “Authentication” section and save the file. First up we will create a Authentication helper class that will handle the authentication actions. To get the identity of the logged in user we will retrieve the access token from the authorization header in the request. Add a new class file to the project and call it “AuthenticationHelper”. Add the below method, this method will retrieve the access token from the authorization header and construct a “UserAssertion” (The UserAssertion object is a credential type representing user credentials) object that is needed to authenticate against Azure Active Directory. With the UserAssertion object that represents the current user we can retrieve a AccessToken from Azure Active Directory for Azure SQL Databases. Add a new controller to the controller folder and add the following fields and constructor in order to have everything in place (settings and httpcontext). Next up is implementing the “Get” method of the controller to retrieve the data from the SQL server. In the method the access token is retrieved by the authentication helper and passed through to the connection (the “AccessToken” properties is only available in the .Net Framework 4.6.2 or higher) then a select all query is performed on the SQL database to retrieve all the data and return it as a JSON string. In order for the application to delegate the permissions to Azure SQL Server the application registered for our API within Azure Active Directory will need to get this permission. The following steps will make sure you set this up and add alter the last settings within the configuration. Open the “Azure Active Directory” blade. In the blade click on “App Registrations”. In the “App Registrations” blade find the application that was registered by the creation of your project and click on it. In the application blade that opens click on “Required Permissions”. In the blade that opens click on “Add” to add a new permission. In the “Select an API” search for Azure SQL Database and select it. The permission step will open, make sure you select “Access Azure SQL DB and Data Warehouse” under “Delegated Permissions” and click “Select” and “Done to save the configuration. In order to make this work without any problems we need to give consent for this application to access Azure SQL Databases as the logged in user. Note: Normally a user will get a consent window but as this is a API we will set this consent automatically for every user by clicking “Grant Permissions”. To make use of delegated permissions we also need a ClientSecret. Generate this within the Azure Portal and update the “appsettings.json” file within your project with this key and your connection string. With the application ready publish the API to Azure as you know from regular .Net framework projects. In the next post we will create a console test application that will call the API with a specific user.